, a Spanish artist, and styled the Michel Angelo of Spain, because he excelled in painting, sculpture, and architecture, was born in the city of Grenada in 1600, where his father, an eminent architect, educated him in his own profession, and when his instructions in this branch were completed, he applied himself to the study of sculpture, and made an uncommon progress in a very short time. He next went to Seville, and for eight months studied under Pacheco, and afterwards under Juan del Castillo, in whose academy he executed many noble paintings for the public edifices in Seville, and at the same time gave some specimens of his excellence in statuary, which were highly admired, particularly a “Madonna and Child,” in the great church of Nebriga, and two colossal figures of San Pedro and San Pablo. Count Olivarez was the means of his coming to Madrid, where he was made first royal architect, king’s painter, and preceptor to the prince, don Balthazar Carlos of Austria. Here, as architect, he projected several additional works to the palaces, some public gates to the city, and a triumphal arch erected on the entrance of Mariana, second queen to Philip IV. As a painter, he executed many celebrated compositions in the churches and palaces of Madrid. | While in the height of his fame an event happened which involved him in much trouhle. Returning home one evening, he discovered his wife murdered, his house robbed, while an Italian journeyman, on whom the suspicion naturally fell, had escaped. The criminal judges held a court of inquiry, and having discovered that Cano had been jealous of this Italian, and also that he was known to be attached to another woman, they acquitted the fugitive gallant, and condemned the husband. 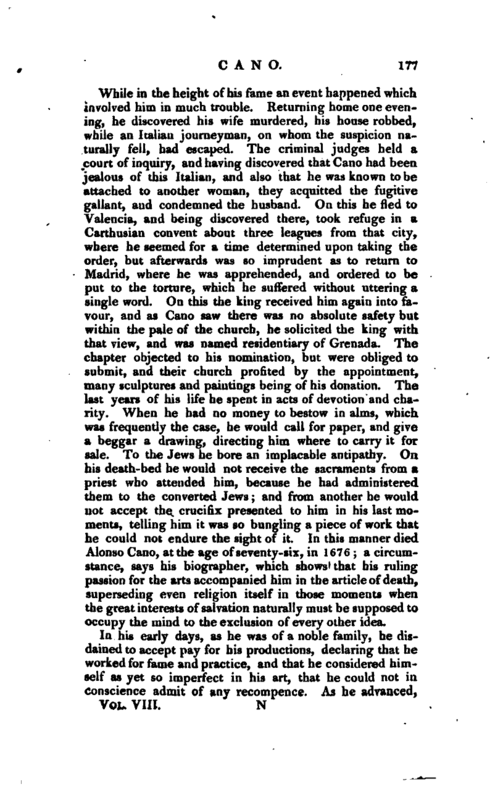 On this he fled to Valencia, and being discovered there, took refuge in a Carthusian convent about three leagues from that city, where he seemed for a time determined upon taking the order, but afterwards was so imprudent as to return to Madrid, where he was apprehended, and ordered to be put to the torture, which he suffered without uttering 3r single word. On this the king received him again into favour, and as Cano saw there was no absolute safety but within the pale of the church, he solicited the king with that view, and was named residentiary of Grenada. The chapter objected to his nomination, but were obliged to submit, and their church profited by the appointment, many sculptures and paintings being of his donation. The last years of his life he spent in acts of devotion and charity. When he had no money to bestow in alms, which was frequently the case, he would call for paper, and give a beggar a drawing, directing him where to carry it for sale. To the Jews he bore an implacable antipathy. On his death-bed he would not receive the sacraments from a priest who attended him, because he had administered them to the converted Jews; and from another he would not accept the crucifix presented to him in his last moments, telling him it was so bungling a piece of work that he could not endure the sight of it. In this manner died Alonso Cano, at the age of seventy-six, in 1676; a circumstance, says his biographer, which shows that his ruling passion for the arts accompanied him in the article of death, superseding even religion itself in those moments when the great interests of salvation naturally must be supposed to occupy the mind to the exclusion of every other idea. In his early days, as he was of a noble family, he disdained to accept pay for his productions, declaring that he worked for fame and practice, and that he considered himself as yet so imperfect in his art, that he could not in conscience admit of any recompence. As he advanced, | however, he had no scruple in accepting the just reward of his merit; and the following anecdote, related by Mr. Cumberland, will show his spirit in asserting what was his due. 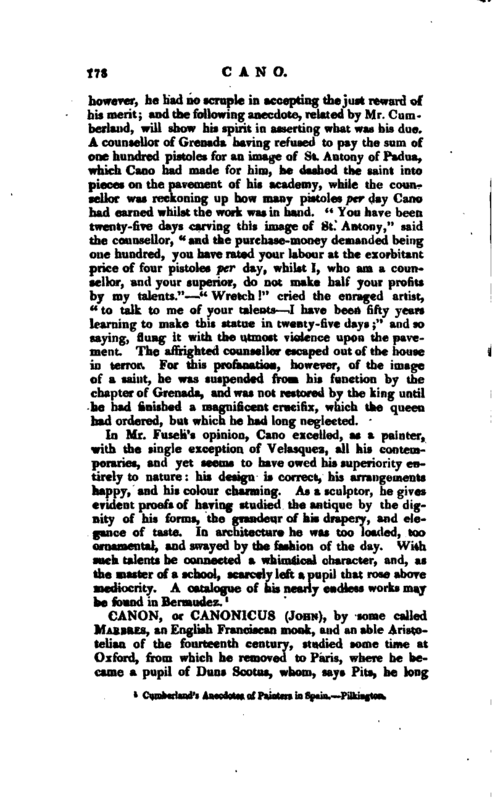 A counsellor of Grenada having refused to pay the sum of one hundred pistoles for an image of St. Antony of Padua, which Cano had made for him, he dashed the saint into pieces on the pavement of his academy, while the counsellor was reckoning up how many pistoles per day Cano had earned whilst the work was in hand. “You have been twenty-five days carving this image of St. Antony,” said the counsellor, “and the purchase-money demanded being one hundred, you have rated your labour at the exorbitant price of four pistoles per day, whilst I, who am a counseller, and your superior, do not make half your profits by my talents.” “Wretch” cried the enraged artist, “to talk to me of your talents I have been fifty years learning to make this statue in twenty-five days” and so saying, flung it with the utmost violence upon the pavement. The affrighted counsellor escaped out of the house in terror. For this profanation, however, of the image of a saint, he was suspended from his function by the chapter of Grenada, and was not restored by the king until he had finished a magnificent crucifix, which the queen had ordered, but which he had long neglected. 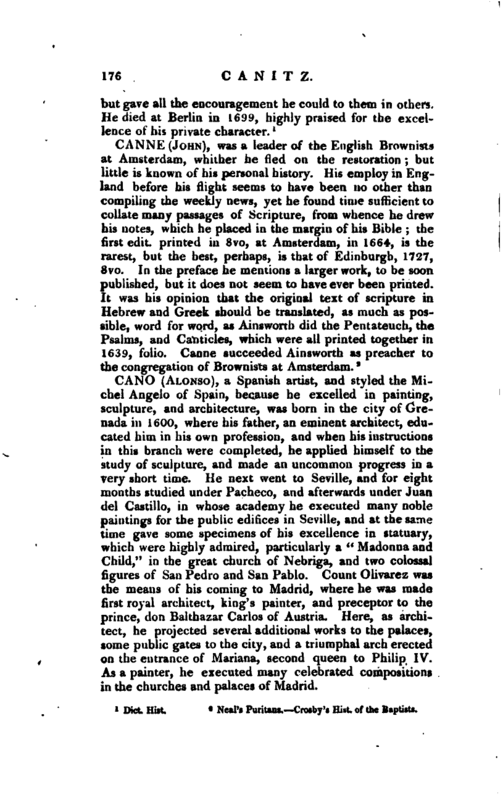 Cumberland’s Anecdotes of Painters in Spain.—Pilkington.